A few years ago, in the x0x forums, a few people made a doughter-board with a much bigger CPU (atmega2561) than the original (atmega162). It's a small board with the new CPU on it, and 40 header pins which plug right into the atmega162 socket on the x0xb0x. Some time later, guest modified the stock firmware to work on this bigger CPU, and also made a bootloader for it, based on stk500v2. This "Vx" cpumod didn't quite get into the hands of many people, i think only about 10 were made. After i got myself one of those (after so much waiting) i began modifying the firmware as i wanted (the n0nx0x2 project). It's redesigned, yet still compatible with the first one (the firmware will work identically). This one has a different shape, optimized to not collide with the tall caps to the left of the IC slot, so less effort to "install" it (just 2 polyester caps will have to be bent down a bit). It will be pre-flashed with the x0xb00t2.1 bootloader (see below) and fuses and lock bits correctly set and locked so that it's impossible to corrupt the bootloader afterwards. First, unplug your original cpu from the socket. IMPORTANT: If it requires a lot of force to plug the cpumod in the socket, or you hear crackling sounds - stop. Widen the socket holes with something. The cpumod should plug-in smoothly, don't crack your x0xb0x and/or the cpumod! There will be two polyester capacitors right under the cpumod that are normally sticking out and are too tall - bend them down a bit. The normal installation method should work for normal x0xes, that is, standard ones with the standard pactec enclosure, or any other enclosure that is not smaller than the pactec. However, there are other x0x variants like the x0xi0, where the mainboard is altered. In those cases, the alternative installation would require some DIY. The idea is to connect the cpumod as a "tumor" using flatcables from the cpumod board with 40 pins on the other end. Thus plug those 40 pins into the cpu socket, and put the cpumod wrapped in a bag or something, so it doesn't touch the x0x internals. What's the reason for the cpumod? 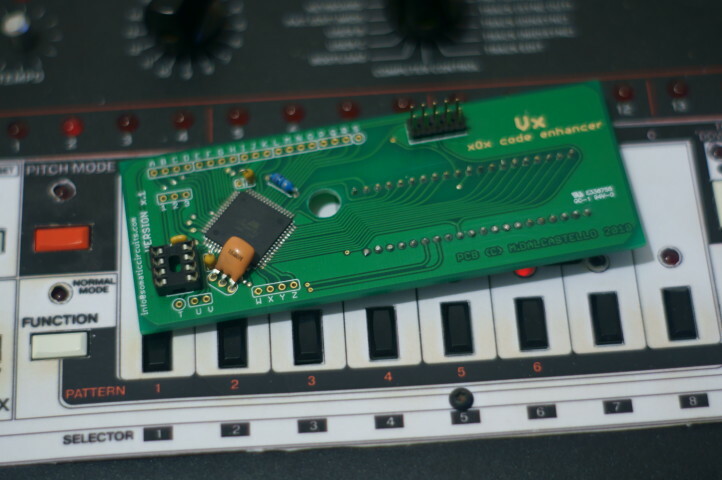 The x0xb0x originally uses the atmega162 cpu, which isn't very big in terms of flash memory. The most famous x0x firmware for the atmega162 - SokkOS, has already reached the 15.5kB limit, and from there - new features cannot be added unless something else is removed or optimized to death. This makes it a pain for the firmware developers. 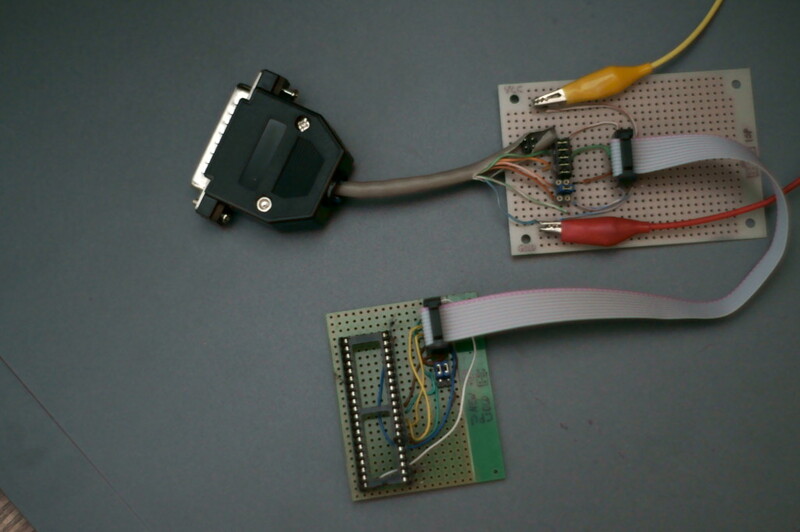 Also, the x0x bootloader on the atmega162 had to fit into barely 0.5kB and thus it's very primitive. It has simple 1-byte commands, no visual indication of any sort, so sometimes it's hard to determine if it works or not. 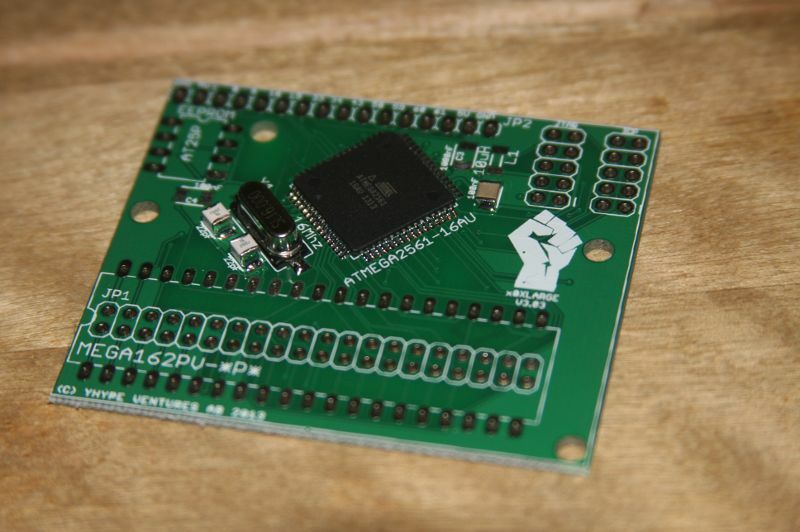 The atmega2561 has 256kB of flash space, that's 16 times the old one. It also has more I/O pins which can be used for extra modification. The cpumod board re-routes the pins from the new cpu to the old cpu, and leads out the extra I/O nicely on the board, ready for modification. The cpumod uses the existing EEPROM from the x0x mainboard, but also has internal 4kB eeprom, and a socket for another external EEPROM. Now there is no more pain when developing for this cpu! The bootloader sits on 8kB of space and runs at a faster baudrate. It uses a more complex protocol (stk500v2), which was further enhanced (x0xb00t2.1) with visual indication (LED indication and progress bar), and was also equipped with MIDI-SYSEX. The biggest difference with the old (162) bootloader is that this one uses 57600 baudrate and uses a less-primitive protocol. guest has adapted it to work like the old bootloader - on boot, it reads the MODE selector value and if it points to "BOOTLOAD" - the bootloader remains running, otherwise jumps to the firmware. The stk500v2 protocol uses messages encoded into fancy packets with checksum and thus it's more safe (think of what happens if the user is accidentally sending random data to the serial port, this could easily erase the firmware with the old bootloader). Thus, the c0ntr0l app and c0nb0x won't work with this bootloader at all, instead, avrdude has to be used (or anything which can program an stk500v2 bootloader). 13.09.2013: Updated: recompiled with "-static"
This is a small command-line tool, should be buildable on other platforms (uses std::cout, fstream and such). To use the tool: call it from a command prompt or terminal and pass the .hex file as an argument. - Replace the PORT with the name of the virtual serial port (e.g. COM3, /dev/ttyUSB0). - Replace the firmware.hex with the actual file name. - If you don't want to wait for the verification - add "-V" into the arguments to skip it. See "avrdude -?" for full list of arguments and usage. Note: this is not needed for the x0xLARGE cpumod since it has ICP already, unlike the Vx. I was using this with a cheap USBASP programmer, which recently stopped working, so i am using my old PC's parallel port as a programmer. There's only one small inconvenience that there's no +5V via the parallel port itself, so i take +5V from the usb port via those croc clips. The cpumod simply plugs into this adapter.